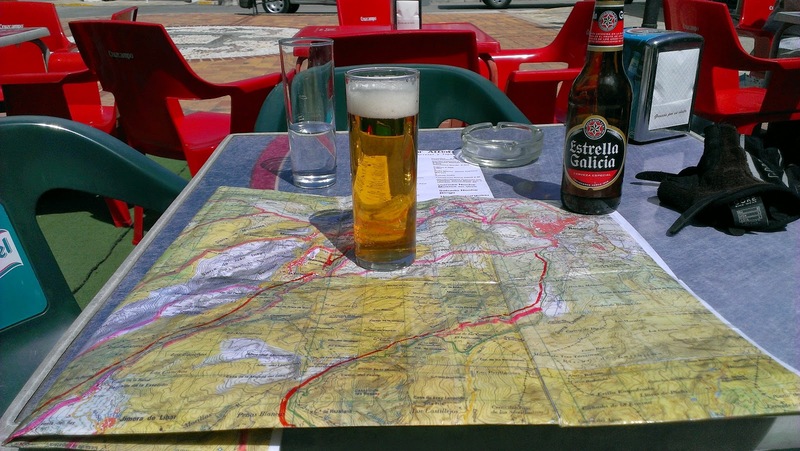 It's not often I've had the chance to ride anywhere other than the UK so when we'd decided to head out to Spain for a spring week, I took the chance to do some research on what my options might be. Fair to say that the Costa del Sol isn't exactly the best for mountain biking - too many busy roads / built up areas. However, I knew that not far inland there is a massive change of scenery and pace. Googling around, I managed to locate a couple of outfits based in Ronda and was soon in touch with Wayne from Hike and Bike. A couple of emails later and I'd arranged the rental of a bike and for Wayne to suggest a couple of routes for me. Turning up on day 1, I was introduced to the bike, had my pedals fitted, a route downloaded to my GPS, a hardcopy map and given some advice by Wayne before setting off north of Ronda. The route turned out to be pretty inspired as it initially followed the railway line, making navigation a dawdle. Before long I was out into "proper" rural Spain and enjoying the mix of tracks and quiet roads. A couple of wrong turnings were involved - mostly when I was too busy looking at the scenery to pay attention to the route - but I was easily able to correct them. The only major issue of the day occurred on an incredibly steep descent when my rear brake pads just wore out. A couple of messages to and from Wayne and I figured I'd opt to return by the "out" route to save any more steep stuff. This turned out to be a blessing in disguise as I was able to spend a bit more time (including a cake-stop) in the amazing little town of Setenil de las Bodegas, where the houses are built under the overhanging rocks. After a bit of further route-finding through some small farms and larger estates (complete with goats), the railway-side track made for an easy and fast return. Getting back to Waynes, I noticed that the rear wheel was actually wobbling - the result of a loose bearing. That would have accelerated the brake pad wear, so at least we had an explanation. After a lazier day by the beach, I was back again for a different route. This one was a bit shorter, but included some more mountainous terrain. This was definitely even more off the beaten track and had some amazing views. I could add a caption here but it's all explained in the next photo! The GPS route also, handily, took me to a bar where a good sandwich and some local beer was thankfully consumed. Just the one occifer, honest! The return to Ronda was mostly less hilly and led along a narrow gorge for quite a distance. The river looked superb - I wonder if anyone ever rafts it? Narrow, with a steep drop off. I was careful. I met a group of women from Edinburgh of all places. One was kind enough to take this photo for me. The day ended with a view of Rondas famous bridge - from the bottom - and a really steep climb up an old Roman cobbled road. Just enough to finish me off! !